Chilly autumn Saturdays just beg to be accompanied by warm + creamy spoonfuls of comforting soup. I roasted garlic + butternut squash and puréed the mixture with softened leeks + carrots + chicken stock. Warmed it over medium heat + added a cup of brandy + simmered until all of the alcohol cooked off. 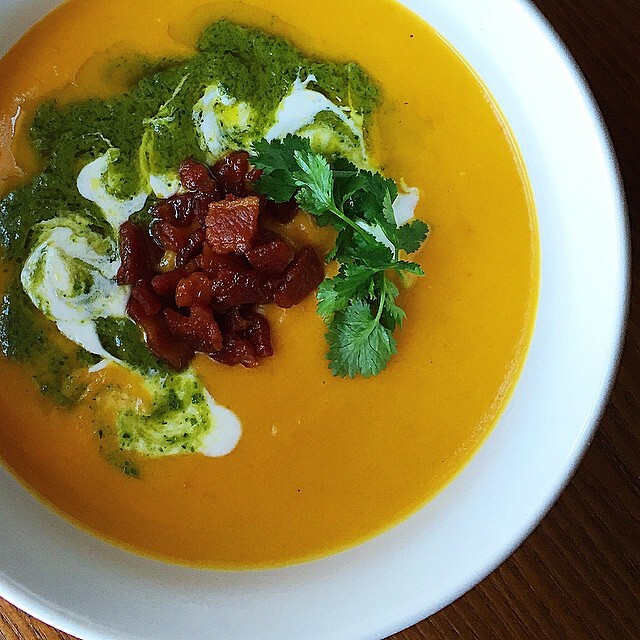 I served the butternut bisque with a roasted poblano + mint + cilantro oil + deliciously tangy Mexican crema + crispy pancetta. Butternut squash feels like one of the ultimate fall foods due to it's cozy and warming flavor. What I love about it for peak training season is that in addition to loads of antioxidants, it also provides Vitamin B6, which helps protect the immune system - really important as we call on our bodies for more and more milage just as the temps start to drop. The use of chicken stock here gives this seasonal soup some heft, and topping with a little pancetta makes this dish satiating enough for lunch. My personal update will be to use Greek yogurt in place of the Crema. Can't wait to try it!